With more than 60 flavors to tempt your taste buds, only Capella Flavor Drops offer the most diverse, delicious, and highly concentrated selection of water soluble, multi-purpose flavorings. 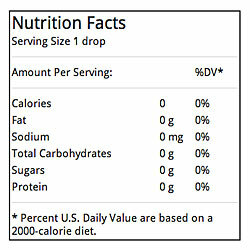 Capella Flavor Drops contain no fats, calories, sweeteners or preservatives. The highly concentrated nature of these drops delivers a superior, pure flavor concentrate, 100% free of preservatives and stabilizers. Each bottle contains more than 600 drops, enough to flavor 60 eight-ounce protein shakes! Capella Flavor Drops are made in San Marcos, California, using the finest ingredients available in the USA. Capella Flavor Drops are water soluble, highly concentrated, pure flavoring. Zero fat, calories, or sweeteners. NO preservatives, stabilizers, diacetyl, or potassium sorbate. Gluten-free and vegan friendly. Capella Flavor Drops contain no animal products of any kind. Guilt free. Create sugar free, low-calorie drink and food alternatives. Perfect for diabetics and dieters. Creating or adding flavor to your own e-liquid or e-juice is very cost effective, easy, and provides an unlimited variety of flavors and flavor combinations for your e-liquid. With these 13ml bottles, Capella makes it easy to try as many as you want, as well as create flavor combinations such as Marshmallow, Double Chocolate, and Graham Cracker for the flavor of s’mores. Capella Flavors Inc., a California State Health Licensed Facility and FDA Registered company, follows the strictest guidelines of the GMP (Good Manufacturing Practices) & SOP (Standard Operating Procedure) processes. Non-flavor Ingredients: Propylene glycol (used as a carrier to dissolve flavor ingredients), water.